The Stand Up To Cancer Credit Card currently has an Informr score of 6.7 out of 10. This score is based on our evaluation of 3 sources including reviews from users and the web's most trusted critics. 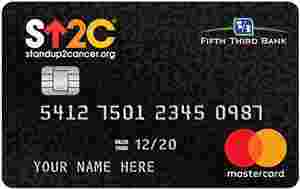 Stand Up To Cancer Credit Card is typically available to those with good credit scores (650 or greater). Every qualifying purchase you make with your Stand Up To Cancer Credit Card helps Fifth Third support Stand Up To Cancer. With this card, you will earn 1 Real Life Rewards point for every $1 you spend as well as a 0% introductory APR on purchases and balance transfers for the first 12 billing cycles. You'll enjoy 0% introductory APR for 12 billing cycles and earn rewards points for every $1 spent on purchases. Be aware that you'll be charged a fee for each balance transfer. Also, with this card being MasterCard you'll earn travel benefits such as airport concierge, roadside services and travel assistance services.